Producer-wholesaler Distell has launched Libertas Vineyards and Estate as a new stand-alone company with ownership of all the premium wine brands. 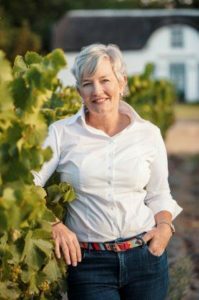 Libertas Vineyards and Estate Kay Nash. This marks a shift from the company’s previous approach where premium wines were managed as a division within a multi-category portfolio. Business turnaround specialist Kay Nash is managing director. The portfolio of brands includes Alto, Nederburg, Durbanville Hills, Plaisir de Merle, Pongrácz, Fleur du Cap and Allesverloren and as well as the unique heritage assets of Chateau Libertas, Zonnebloem and the Tabernacle. The new business will also use the famous Oude Libertas site as its physical home. First priority is said to be a review of the large portfolio which currently consists of eight brands and 40 sub-brands incorporating 384 SKUs (stock keeping units) operating in 88 markets globally. Secondary production will also be consolidated from four sites to a single site at Nederburg to ensure a more efficient supply chain.